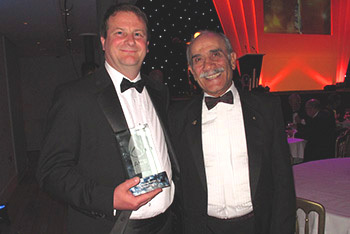 Already proud winners of two ACR awards, Business Edge collects it’s third award in as many months from the National Air Conditioning and Refrigeration Awards. Business Edge has delivered training courses to the air conditioning, refrigeration and heat pump industry since 1990. During this time, by listening to feedback from customers, the company has been able to develop a range of courses to meet the needs of the ACR&HP industry, which also reflect amendments to legislation. The company is well-known for offering bespoke training courses at their training venues or at customers’ own premises (e.g. Coca Cola / F Gas Management, Daikin / Technical Sales, WOSAIR / Off-Shore Ventilation) and have worked with educational establishments to offer AC&R courses, which would not otherwise be available (e.g. training at Petroc College in Tiverton and Highlands College in Jersey). In addition, Business Edge has worked closely with the Career Transition Partnership to develop a comprehensive training programme for personnel leaving the Armed Forces so as to equip them for civilian work within the AC&R industry. To ensure the training programme was exactly what employers needed, when first developed it was presented to members of the Armed Forces, Resettlement Officers and a range of potential employers from end users, contractors, consultants and manufacturers – an impressive number of candidates (in excess of 90%) secure employment in this field at the end of the course. Business Edge is also approved to offer courses via ELCAS so that Service Leavers are able to use their Enhanced Learning Credits in 3 stages over the following 10 years to maintain and increase their level of knowledge. In 2013 the Business Edge training centre at Waterlooville was fully equipped with working heat pump systems, consisting of air-to-water (both mono-bloc and split), as well as a fully operational ground-source heat pump to enable candidates to be trained in the installation and commissioning of the latest domestic heating products. The QCF course is recognised as the technical competency required to achieve MSC Accreditation. This allows candidates to be able to offer their customers the added benefits of the Renewable Heating Incentives. 929 delegates attended a Business Edge training course in 2013.